This Roll-A-Cover retractable roof enclosure, which was installed in July 2018, is a retractable skylight atop this posh Chicago cocktail bar. Viewpoint Enclosures, a Roll-A-Cover dealer, installed this particular retractable roof. The Joule Hotel in Dallas is a luxurious hotel downtown. It has a stunning rooftop bar with a Roll-A-Cover retractable roof skylight. It is the perfect space for any event at any time of the year thanks to its retractable roof. Lucas Confectionery is a chic neighborhood wine bar with a rustic garden. Patrons can sit in the garden year-round, even when the weather is inclement, because of its retractable roof. Sofia is a sleek Italian steakhouse in Englewood, NJ. 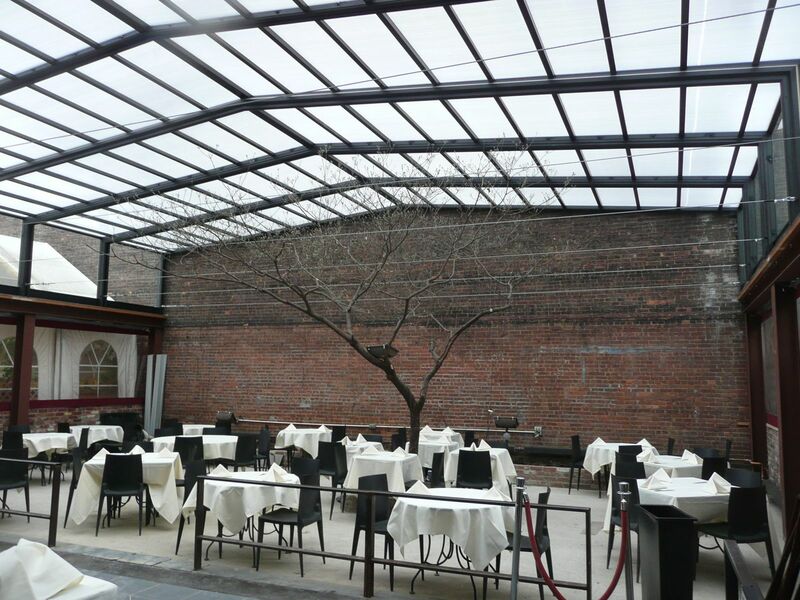 The retractable roof enclosure on its garden dining area allows for year-round use and a gorgeous ambience. I Tre Merli is a beautifully classic Italian restaurant in SOHO. Its garden area is enclosed with a retractable roof enclosure that allows patrons to feel like they are outside while they are dining, even when it isn’t open. According to the I Tre Merli staff, “Our covered garden has a retractable roof, making it the perfect setting for an outdoor meal in any season! Acqua Santa is a stunning Italian restaurant in Brooklyn. Its garden area in the back of the restaurant has a retractable roof. The room will make you think you are in Italy! Blue Moon restaurant in Rehoboth Beach, DE, is situated in an elegant Victorian beach house. It features a retractable roof on the upper level, perfect for year-round dining and star gazing! The Ugly Mug, Washington, D.C. The Ugly Mug is a casual sports bar in the heart of Washington, D.C. with a retractable roof. “Installing the roof has allowed me to have the benefits of a rooftop deck during the summer and extra seating during the winter,” said Gaynor Jablonski, Founder of District Restaurant Group.